2.Switch to Hands-free mode automatically from music playing status when receiving call. Crystal Sound Quality: By adopting advanced interference and noise cancellation CVC (Clear Voice Capture) technology, the bluetooth FM transmitter can provide you clear, crisp sound quality during phone calls and music playback. NO STATICS, NO NOISE, NO ECHO. 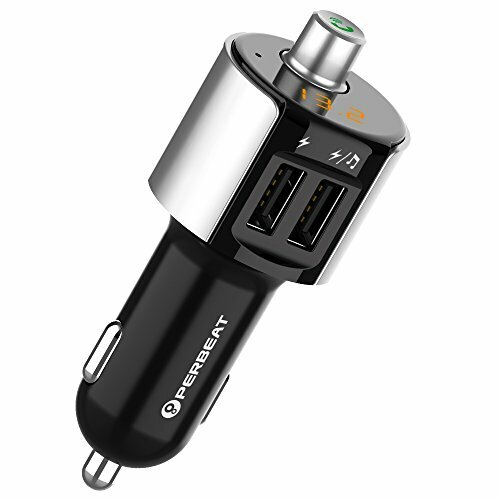 Dual usb Car Charger: The quick charger USB Port can be up to 5V/2.4A,another port can be 5V/1A,able to charge two devices simultaneous.more over,it support max capacity 32G USB music player,help you relax in the long drive. Caller Number Broadcast & Handsfree Calling: clear female broadcast the incoming call number to remind you the caller, lightly press call button enables you handsfree anwsering,safer and more convenience,two quick press to hang up the calling. Universal Compatibility: Works with all Bluetooth enabled devices, such as iPhone, iPad, iPod, Tablet, and Android smartphone; Stream music, car navigation or calls from your mobile devices to car stereo system via FM radio signal( 87.5-108.0MHz). If you have any questions about this product by Perbeat, contact us by completing and submitting the form below. If you are looking for a specif part number, please include it with your message.